The fourth industrial revolution implies the robotization of production, data exchange and control systems. All this is expected to help reduce significantly operational costs, expedite operations and increase labor productivity dramatically. Just about a century and a half ago, the industrial revolution completely reshaped the world affecting the life of millions of people. Today the fourth industrial revolution can entail a radical transformation of the world. And today, as back then the question is who will be able to gain in this inevitable upheaval and lead the world, and who will remain among outsiders and will play a purely raw-exports role for global innovation centers. In a globalized world, water transport is the most effective, and in most cases, a way of transporting large shipments of cargo over long distances with high costs though, especially in severe climatic conditions, say, in the Arctic. Russia, due to its geographical position, has largely to deal in its waters with adverse environment. The rapid development of the Northern Sea Route entails the construction of state-of-the-art ice-class vessels. Previously, experts, industry officials and decision-makers have said that Russian shipbuilders should not compete with Asian shipyards, which are leaders in the construction of large but relatively cheap and technically simple ships. Our niche is complex, innovative vessels, capable, among other things, of operating in extreme conditions. The operation of such vessels, however, is associated with extra costs. First, the crew will have to undergo special training and accordingly should have higher pay. Secondly, work in extreme conditions, for example, in the Arctic, poses higher risks to seafarers’ life and health, which will also generate additional costs shipowners and supply chain agents have to bear. Thirdly, the human element risk still exists and even a shipmaster’s error in the Arctic can lead to an ecological catastrophe. All these factors and the well-developed network of scientific and production associations, shipyards, naval architecture and marine engineering centers and institutes, etc. create excellent prerequisites in Russia for the development of innovative unmanned and autonomous ships, electronic navigation systems and digitization of logistics processes. This future industry could generate a powerful multiplier effect in the real and innovative sector of the economy. The country’s leaders have commented on numerous occasions the need to double the country's gross domestic product with the focus on innovations. Moreover, the decision has been approved at the highest level to establish National Technological Initiative which has become a framework for Marinet Group dedicated to the development of innovative maritime technologies. The leading countries of the world understand the significance of it as a segment of the fourth industrial revolution. For example, Wartsila, a corporation headquartered in Finland, acquired Russia’s Transas in 2018 with a purpose to create an information environment, a ‘marine ecosystem’. It undertakes active efforts to create autonomous ships and to digitalize marine operations. As representatives of the Finland’s corporation earlier told IAA PortNews, the companies of Transas Group will remain Russia, which is a good news. Similar work is underway in S. Korea, Germany and other developed countries. The programme of SMM, a high-profile maritime fair held in Hamburg last week, included an international conference organized by Marinet group with the support of Media Group PortNews and sponsorship of RVC, which was attended by representatives of Russian and global leaders in the mentioned spheres. The purpose of the conference was to summarize the best practices and to discuss the regulation matters. Representatives of Russia told about a significant progress, both technical and regulatory, in the sphere of creation and introduction of unmanned and autonomous ships, marine equipment and e-navigation. When speaking at the Conference, Aleksey Donskoy, General Director of Engineering Center of Shipbuilding, told about the successful project of research and production company AME (Air and Marine Electronics) on creation of an unmanned boat and about the conversion of the developed technologies for civil ships. Together with AME, ECS is going to launch pilot projects on testing autonomous navigation and remote control systems in 2018-2019. A sea/river bulk cargo ship, a small-tonnage tanker, a ferry and an icebreaker will serve as a platform for such projects. Aleksey Rakhmanov, head of United Shipbuilding Corporation told about the beginning in 2018 of the construction of an innovative unmanned vessel at Sredne-Nevsky Shipyard (part of USC). According to Aleksey Rakhmanov, construction of unmanned ships is only possible after solutions are found to principal issues of international cooperation. He believes it is important to define common principles of onshore infrastructure development, work with prototypes and models. Aleksey Dobrodeyev, representative of Krylov State Research Center, told about KSRS studies related to creation of unmanned ships able to carry cargo along the Northern Sea Route in ice channel behind an icebreaker. He emphasized that the idea was driven by construction of powerful icebreakers able to break through Arctic ice at commercial speed to ensure assistance to convoys of cargo ships. “Having powerful icebreakers we can start developing a concept of unmanned cargo carriers able to follow an icebreaker along the ice channel”, said Aleksey Dobrodeyev. According to him, an additional advantage of unmanned ships is that these technologies can be used for transportation of hazardous cargoes, in particular radioactive materials, with a reduced level of biological protection, which ensures final cost reduction. During the “Digital navigation vs e-Navigation” panel battle, Aleksander Potemkin, Kronshtadt Technologies, and Jin Hyoung Park, KRISO, shared their experience in e-navigation development in Russia and in South Korea. The Hermitage and SMART-Navigation projects will let considerably improve navigation safety having ensured fast data exchange between vessels and control centers. Dimitris Theodosiou, representative of DANAOS Management Consultants, told about services that digitalization can offer to shipping companies. They will let streamline some operations related to identification of vessels, detection and response to emergency situations, online monitoring of water area etc. When speaking about logistics digitalization, Don Staffin, Managing Director of ShipServ, emphasized that the process is associated with the technology of big data, correct processing and interpretation of which will ensure “big analyses” taking all the factors into consideration. That will consequently make logistics and maritime operations smarter and more efficient. Online poll held during the panel discussion on IAA PortNews’ website shows that most visitors expect the introduction of digital technologies to let reduce water transport costs and improve its efficiency. During the panel discussion on marine robotics, Aleksey Donskoy told about AME’s project on creation of work class ROV Triton-2. The Triton-2 is equipped with a sensor, a camera, a system for searching and positioning of underwater objects. Its working depth is up to 500 meters, cargo lifting capacity – up to 6 tonnes. The ROV is fitted with a complex of hydraulic manipulators for underwater operations. 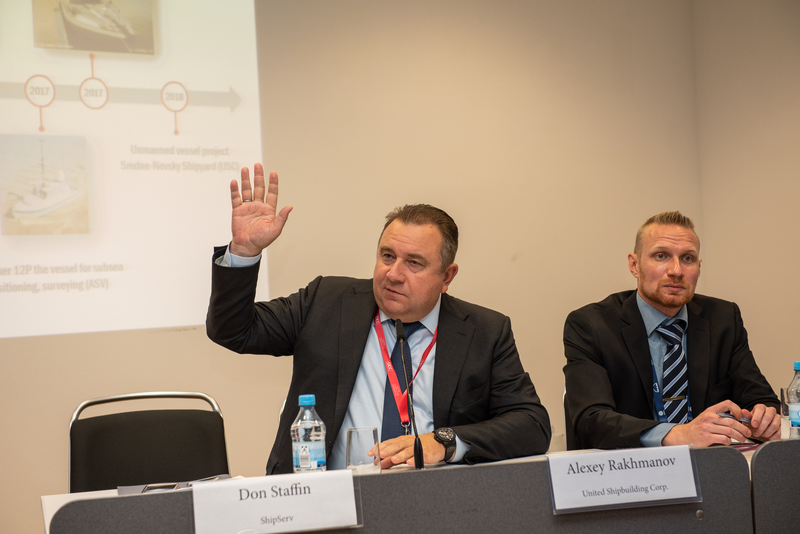 At the roundtable meeting "Marine Robotics: Laws, Applications, Technologies" initiated by the Russian Ministry of Industry and Trade organized by IAA PortNews and held in August 2018, Yury Kostin, Deputy Head of Rosmorrechflot (Federal Marine and River Transport Agency), told IAA PortNews that remotely operated vehicles are in high demand in Russia. According to him, ROVs are widely used for offshore works at the depth of up to 3,000 meters, as well as for different deep-water operations like inspection and maintenance of substructures of drilling platforms, inspection of bottom for pipelaying, inspection of underwater objects, scientific research, etc. “Taking into consideration different projects being implemented in the Russian Federation (Nord Stream 2, South Stream) we see a high demand for such services and lack of ROVs. As of today, Marine Rescue Service of Rosmorrechflot needs more remotely operated vehicles (7 units of the first class and 3 units of the second class)”, said Yury Kostin. Alexander Troitsky, CEO of Nonius Engineering, told in his turn about successful experience in creating unmanned dredgers. In his opinion, robotics in dredging should be further developed in the future. According to him, the market of robotized vessels will grow considerably within a decade. First of all, robotics will be most applicable for mining dredgers... “Robotics is the real future, it is coming and we should be prepared. We should start today, otherwise tomorrow we’ll lose to somebody more prepared”, he said. Taking into consideration the territory of the Russian Federation, the number of ports and the length of inland water ways in Russia, the issues of dredging will always stay relevant. Therefore, innovations in this segment are vital. The Ministry of Industry and Trade of the Russian Federation has recently developed an open catalogue “Marine Robotics. State, Problems, Development Trends” to provide data support and coordination of marine robotics works. The presentation was held by Nikolai Shablikov, Deputy Head of the Ministry’s Department of Shipbuilding & Marine Engineering, at the Marine Robotics roundtable meeting. This catalogue includes open works performed by Russian enterprises for maritime application. Its development showed the demand for catalogues providing information related to marine robotics, emphasized Nikolai Shablikov. Technically, autonomous and unmanned shipping is not a big problem now while absence of legal and regulatory framework is a challenge. As Vitaly Klyuev, expert from the Federal Marine and River Transport Agency (Rosmorrechflot), said at the Marinet conference, Russia can take lead in this respect. “In Russia, there is a significant progress in the development of unmanned shipping regulations. RF Government is working intensely to develop national regulations to provide legal framework for unmanned shipping... I hope, Russia will be the first or among the first countries to create a legal platform for operation of unmanned ships”, said Vitaly Klyuev. According to him, for that purpose we should set forth technical requirements for vessels, provide regulations on seafarers who will be not onboard any more (or no seafarers at all) and define sea areas covered by the regulations. Vitaly Klyuev also told about IMO’s work on issues related to unmanned shipping regulations. There is a definition of an unmanned vessel and its categories. However, technical requirements on construction of ships take into consideration human beings onboard vessels to ensure onboard safety. SOLAS convention initially focused on safety of life at sea is based on it. It is taken into consideration in matters related to vessels structure, actions of crewmembers and their responsibility in case of incidents like oil spills. Of course, such regulations are not applicable for unmanned ships taking decisions based on artificial intelligence. As Jörgen Strandberg, General Manager, Advanced Technology in Wärtsilä Marine Solutions, told IAA PortNews at the marine technology exhibition in Finland, first autonomous vessels would have a “reptilian intelligence”. If connection with an onshore control center is lost they would be able to maneuver around obstacles and prevent incidents. Then, who is responsible in case of possible failures and mistakes of that “reptile”? This and other questions have yet to be answered. When speaking at the Marine Robotics meeting held by IAA PortNews in August 2018, Deputy Head of Rosmorrechflot Yury Kostin said that information systems for marine and river equipment would obtain a legal status in 2019. Besides, the regulators will approve the procedure for development, operation and application of navigation data systems on seagoing ships. Those will be common rules for the Eurasian Economic Union. In 2020, a concept of federal state telematics system will be introduced in RF legislation. Its principles and operation procedure have yet to be developed. The year of 2020 will also see the development of requirements on safety and methods to assess conformity of smart marine/river equipment. The standards for application of underwater robotics and communications will be developed in 2021. Development of robotization in shipping and logistics gives rise to discontent and opposition across the industry. And it’s reasonable as no one wants to lose work. The same phenomenon was observed a century and a half ago at the dawn of the industrial revolution. At the time it was known as Luddites movement, when employees who rioted and destroyed laborsaving textile machinery in the belief that such machinery would diminish employment. It is clear that both then and now, progress can not be stopped, and social problems will have to be solved in one way or another. My opinion is that robotization in shipping will save a lot of human lives, make logistics a lot cheaper and more efficient, create a huge multiplier effect and revive the real sector of the domestic economy. And eventually this will create new jobs, and they will be safer and more creative. This is not wise and good to employ people for transportation of dangerous goods in the Arctic (say, of radioactive ones), even if it gives them job. The development of the real sector, in the innovative segment, will enable Russia’s economy to achieve the long-declared goal of diversification, which in turn will increase budget revenues, to retrain and employ those who may lose their jobs when unmanned shipping and other autonomous technology become a reality. The most important thing to understand here is that upcoming of new industrial revolution is inevitable, just as the first one. It is evident that the world is more integrated today, the competition is much higher, and as a result if all hesitation, doubts and delay will eventually lead to lagging behind.